The customer service team is extraordinary, outstanding and excellent and ready to assist and help especially Mr. Sami, Mr. Moheb and Mr. Abdul also other team members were very collaborative and polite and showing respectful. All was good the food the staff I really like it it was a great stay. Delicious breakfast with lots of options of both local and continental dishes, Hot food and baked breads and delicious fresh juices! Excellent service with friendly staff in every interaction. Great location in business bay area of Dubai...easy taxi ride to any tourist sites. Also had train station close by that was super easy to walk to but beinga family of four with young children, we used more taxis. I like the hospitality of the staff. Very accommodating. Cleanliness , and convenient location. 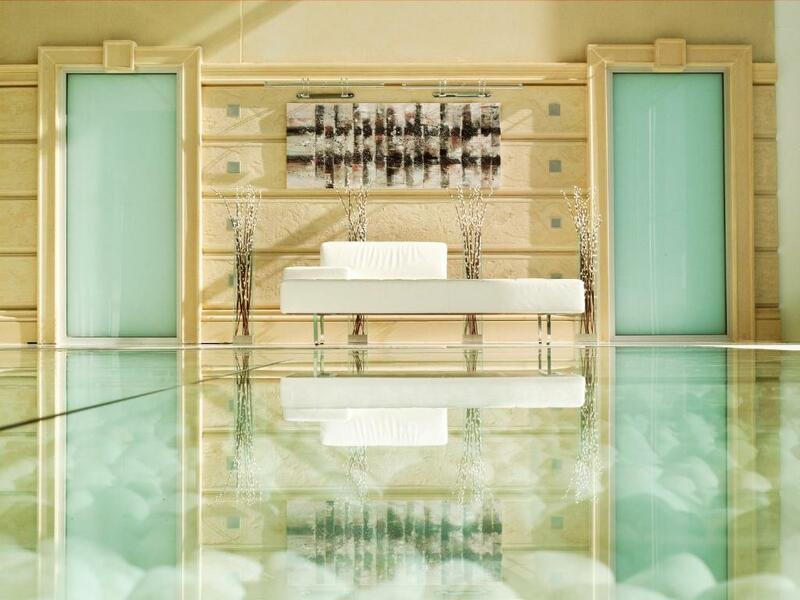 Lock in a great price for Villa Rotana - Dubai – rated 8.8 by recent guests! One of our top picks in Dubai.Featuring a magnificent Burj Khalifa view, Villa Rotana is strategically located on the Sheikh Zayed Road, offering easy access to Dubai Mall. Business Bay Metro Station is 1,000 feet away, while Dubai Media City and Internet City are located 2.5 mi from the property. The hotel’s Moka Café is open throughout the day and serves a range of snacks, light meals and refreshments. In-room dining and daily housekeeping are also available at the property. Additionally, Villa Rotana also features premier services such as a rooftop pool, sauna, hot tub and 7 sophisticated meeting rooms. The public beach and the Mall of the Emirates are both 10 minutes away by car. 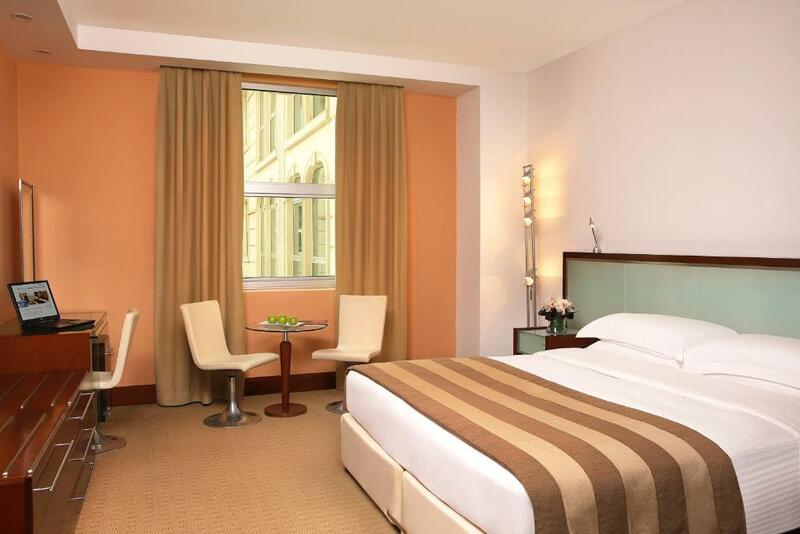 Villa Rotana is located just 6.8 mi away from the Dubai International Airport. 뀐 Located in the top-rated area in Dubai, this property has an excellent location score of 8.9! When would you like to stay at Villa Rotana - Dubai? This luxurious suite comes with a separate living room and a spacious sitting area with a satellite TV. 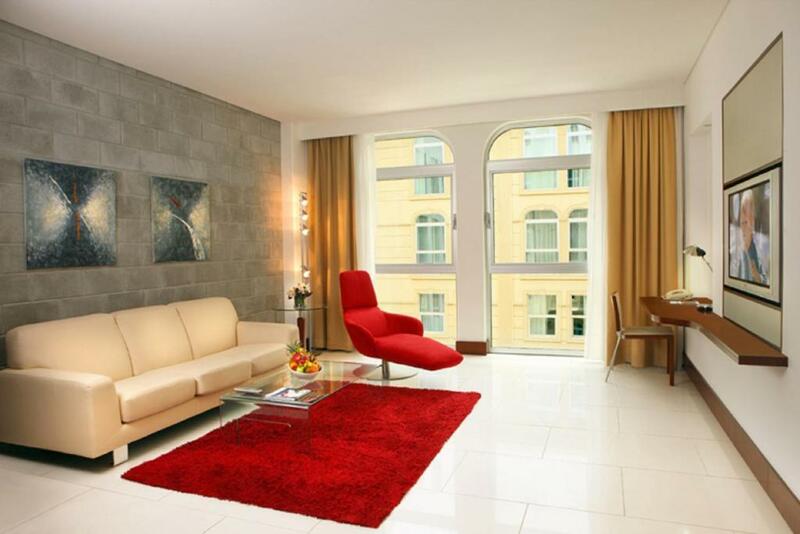 Suites with panoramic views of Sheikh Zayed Road and the Dubai skyline are subject to availability. Featuring a kitchenette, this spacious studio has a satellite TV. It includes a desk and a chair, free tea and coffee, and a private bathroom with a hairdryer. Studios with views of the Burj Khalifa are subject to availability. This spacious suite features a separate living room with a flat-screen TV and a sitting area, The suite overlooks the atrium lobby and has an open kitchen with a dining area. The bedroom includes a satellite TV. This extra spacious suite offers spectacular views of the Burj Khalifa and includes a separate living room with a spacious seating area and an open kitchen with a dining area. The bedroom includes a satellite TV and free tea and coffee making facilities. 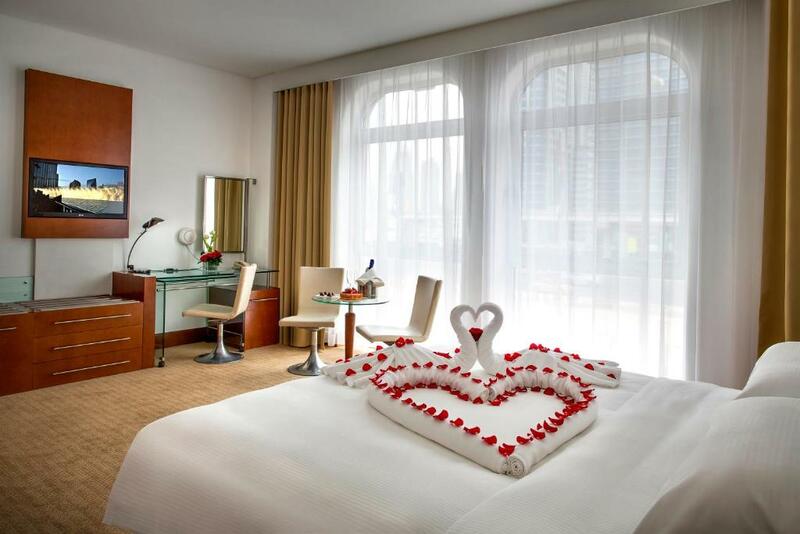 - Enjoy a view of the tallest tower in the world Burj Khalifa with king bed and writing desk with a chair. - A spacious premium studio of 390 ft² that includes in-room safe, 32 inch LED TV, satellite TV channels, hairdryer, minibar, complimentary tea & coffee maker facilities and kitchenette. Villa Rotana Dubai is ideally located on Sheikh Zayed Road in the business hub of Dubai next to the Dubai Financial City, Dubai convention center and Dubai Mall. Overlooking Burj Khalifa the tallest building in the world, Villa Rotana offers 118 spacious and beautifully presented studios and suites. It is elegantly appointed with luxurious bedding and fine furnishings, each room offering high speed internet access appealing to convention, business and leisure travelers alike. The kitchens are custom designed with fixtures and fittings selected to make life easier and more relaxed. 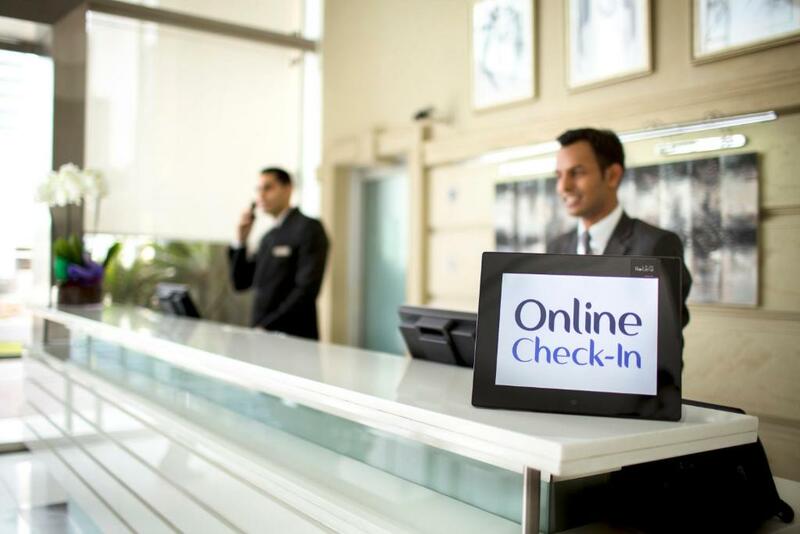 It has an extensive range of facilities and services to capture the image and requirements of all our guests. Villa Rotana has been in hospitality market for more than a decade now, resulting to a huge number of loyalty customers since then. For the past years, Villa Rotana standout keeping its standards and promise to have each guest a treasured time. Our multilingual colleagues plays an important part, as we grow further. Villa Rotana is strategically located on the Sheikh Zayed Road, offers easy access to The Dubai Mall, fondly known as a shopper’s paradise. Situated on the opposite side of the Business Bay Metro station, the hotel is a 20-minute drive from Dubai International Airport. Satisfying our guest’s needs while they are staying with us is one of the greatest achievement of each colleague. Treating them special and made them feel at home away from their home. Off duty, colleagues spent time with other colleagues going to the malls, beach, play outdoor and indoor games and much more. Villa Rotana Dubai is strategically located on the Sheikh Zayed Road, offers easy access to Dubai Mall which is a shopper’s paradise where you can also enjoy the famous Dubai Aquarium and underwater zoo. The magnificent view of the iconic Burj Khalifa is located on the opposite side of Sheik Zayed Road and can closely viewed from the premium rooms of the hotel. Business Bay Metro station is just 2 minutes’ walk from the hotel for your instant commute, and behind the hotel you can enjoy the newly open city walk with a huge number of shopping brands to make your stay more memorable. Area Info – This neighborhood is a great choice for travelers interested in tourist attractions, restaurants and cleanliness – Check location Great location - show map Guests loved walking around the neighborhood! 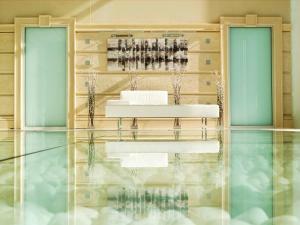 House Rules Villa Rotana - Dubai takes special requests – add in the next step! Villa Rotana - Dubai accepts these cards and reserves the right to temporarily hold an amount prior to arrival. As per UAE Law, guests below 18 years old are not allowed to check-in at the hotel unless accompanied by an adult over 18 years old. Please inform Villa Rotana - Dubai of your expected arrival time in advance. You can use the Special Requests box when booking, or contact the property directly using the contact details in your confirmation. The staff were friendly and courteous. The proximity of the hotel to all shopping areas and to train stations. The place provided all the needed comforts and everyone was ready to make our stay a more enjoyable one. Misleading description regarding being opposite Dubai Mall. In reality a good 20 minute walk. Everything was great . The staff was a exceptional! The best thing , it’s in the city close to everything . Supermarket is within walking distance so if u travel with family, everything is easily accessible. Above all , it’s 24 hour service..
Bad smell from the bed room carpet. Room was great. The front desk was great, polite people and very friendly. 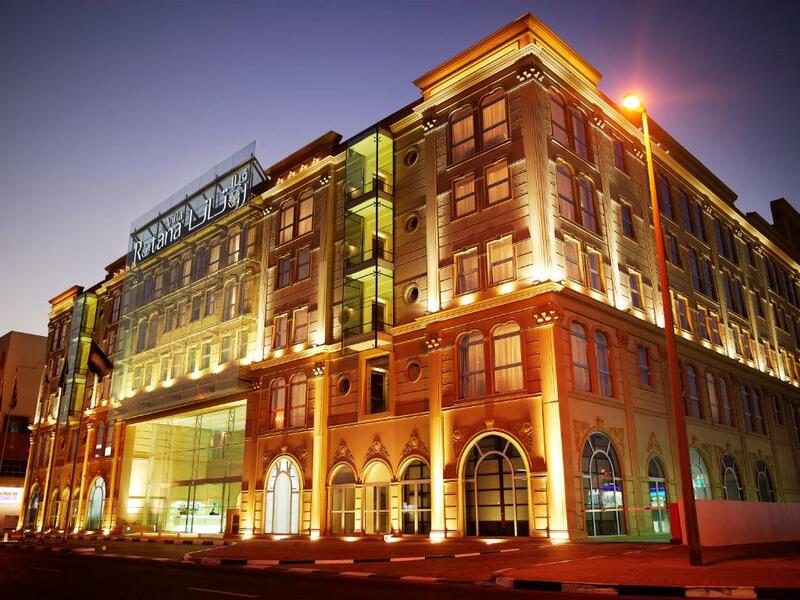 Excellent customer service by everyone in the hotel, good facilities and most importantly the location is ideal for exploring all the major attractions of Dubai. Highly recommended. Breakfast is good but the options are not much to accommodate people's choice coming from different parts of the world. Staff is very friendly and supportive. Rooms are spacious and clean. Overall it was a great experience.